The new gaming phenomenon that is Pokemon GO was officially released in Canada on July 17. Aug. 11, 2016 9:00 a.m. 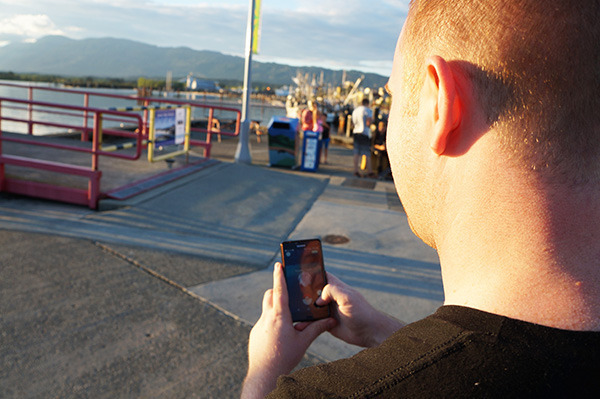 If you’ve noticed groups of people gathering at the Harbour Quay, in parks or even outside of your house holding up their cellphones, it’s probably because they’re trying to catch Pokemon. The new gaming phenomenon that is Pokemon GO was officially released in Canada on July 17, two weeks after the U.S. launch date. An hour after the announcement of the Canadian release on the app’s Twitter page the server overloaded and players had to wait even longer to get the game. The mobile gaming sensation is available free for download on an iPhone or Android and is similar to Nintendo’s Pokemon— catching Pokemon, battling at gyms and evolving your creatures— but players are now doing it all in the real world. Finding Pokemon requires players to actually go to PokeStops to catch the creatures. “It’s fun, it gets me socializing and out walking more than I used to,” said Cathy Whitehead who was out catching Pokemon at the Harbour Quay. Another player, Steve Schram, said he’s rode his bike close to 60 km more than he typically does since he’s picked up Pokemon GO. Nighttime, after about 9:30 p.m., is said to be the best time to search for Pokemon. Tallyn Wittal (pictured). who’s been playing the game for about two weeks, said night is typically when the rare Pokemon are at the hotspots. “One night me and some friends walked around and played until about three in the morning,” Wittal said. Wittal who was a Pokemon fan as a kid, playing the card game and watching the TV series, said it wasn’t hard for him to get the hang of the game. “It’s pretty straight forward,” he said. According to a Digital Stat Article: Amazing Pokemon Go Statistics, from July 26, the average amount of time female Pokemon Go players in Canada spend playing the game daily is 1.6 hours and 2.2 for males. Thirty per cent of Pokemon Go users in Canada stated they skip their day-to-day activities to play. The game took only 13 hours to reach the top of the highest-grossing app chart in the U.S. and Nintendo’s market value increased by $9 billion the first five days after Pokemon Go was launched. Everyone from young children to adults are playing the game and groups are forming in town for players to socialize and share experiences and tips. A Pokemon Go Port Alberni Facebook page is up to 273 members.